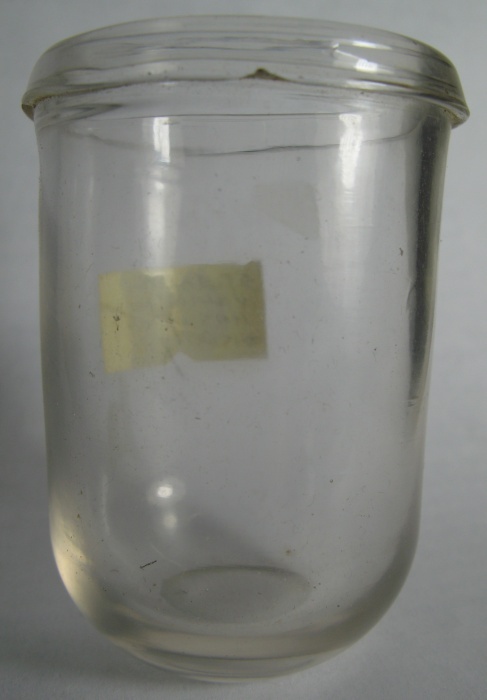 Here are pictures of a clear glass leeching cup from the earlier part of the 19th century. 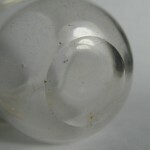 It is 2-3/4″ tall and about 2″ in diameter. It’s a hand blown piece with folded rim and a polished pontil. Got A Question about Your Bottle? The Washington Taylor flask described by McKearin as GI-37 is a fairly common item whether they be the original 19th century bottle or the abundantly reproduced 20th century copy. Determining whether one is a true historical flask or just a replica made by the Clevenger Brothers or other late 20th century manufacturer is not always an easy task for the non-collector. 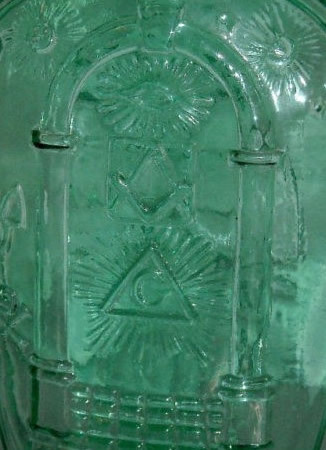 The #37 quart mold is the first of 32 different variations thought to have been made at either Dyottsville Glass Works in Philadelphia, PA or Lockport Glass Works in Lockport, NY. Original bottles exist both as smooth base or with a pontil scar; lip finishes vary from the common shear to single or double collar and even in some cases a square or tapered collar. (1) Some modern replicas are quite different, in shape, size and embossing. It’s the Clevenger Glass Works product which is fairly faithful from the original and causes the greatest confusion. The differences are subtle and in some cases only the experienced collector is going to be able to tell the difference. 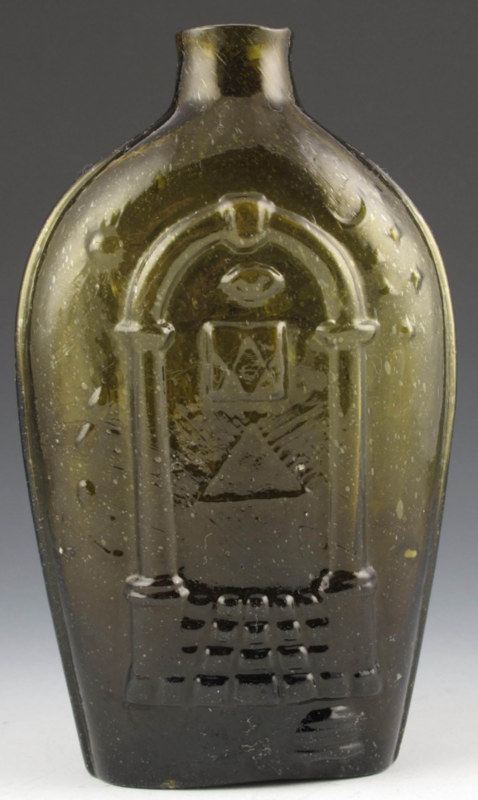 (2) Originals were produced in a wide variety of colors, some of which are rarely seen in 19th century bottles. Modern pieces are found in both the common aqua color as well as brilliant green, yellow, puce and cobalt blue, among others. Colors other than aqua should be an immediate warning sign that the bottle is likely modern. (3) Modern and old are found in smooth base or with pontil scars. Modern and old can have a plain sheared lip or some type of lip finish. 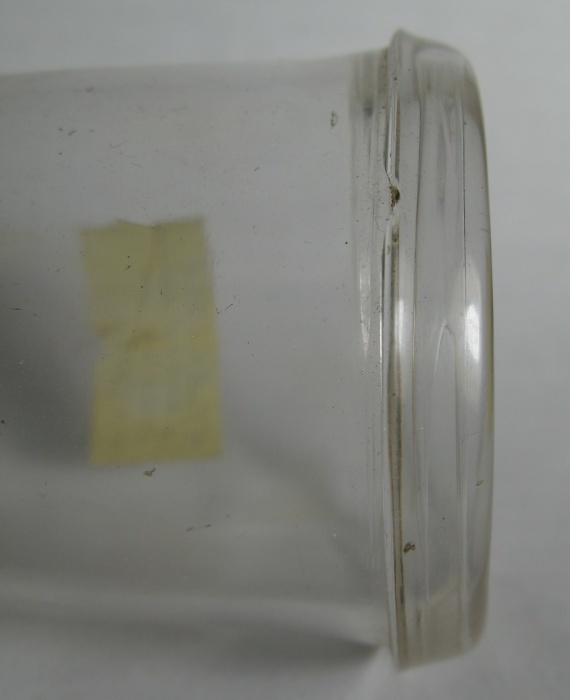 (4) Both modern and old can show similar thickness of glass; similar straw marks, bubbles and potstones. 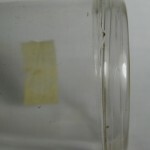 A common trait in modern examples is the bumpy, “orange peel” effect to the glass surface. 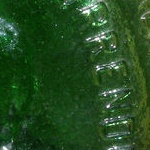 (5) The junction of the neck and body of the modern bottles is often abrupt. As you see in the photos below, the modern examples look like the neck was just jammed onto the bottle. 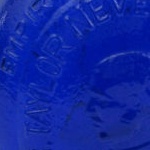 In 19th century bottles, the transition is smooth without a seam or crease. (6) The bases of 19th century examples are either flat or with a large oval recess. 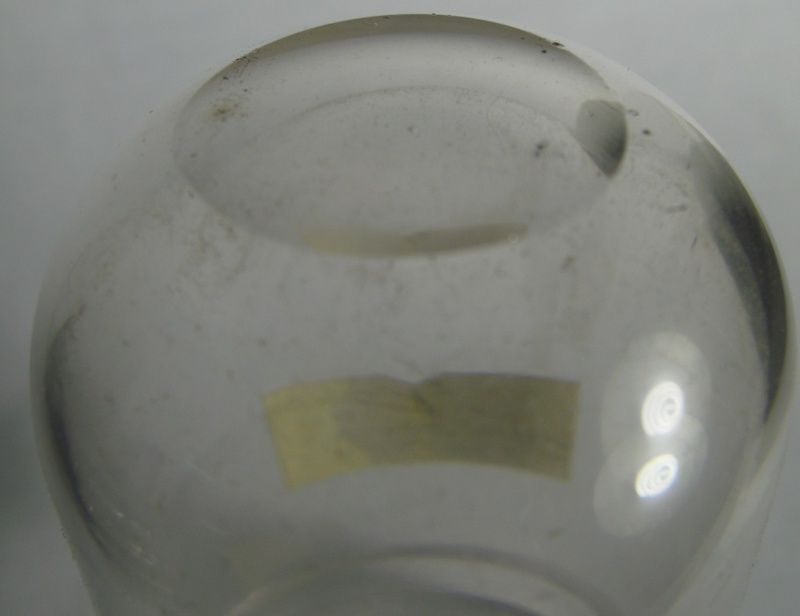 Modern examples have a precisely round concave recess in the bottom center. In some cases, the round recess is obscured by the pontil scar. Reproductions are abundant and do not have much value. Figure $5-20 decorative value. Originals without damage begin in the $75-100 range for aqua and can reach into the $20-30 thousand dollar range for a great example in a rare color. $2-6 thousand is more typical for a good quality colored example. – what does MINT really mean? – how does damage affect value? Tom Haunton has done it again – his latest book on New Jersey glass fills a huge gap in knowledge for the antique bottle and antique glass collector. This first volume has been long awaited: I have been discussing progress on the book with Tom for years now! Volume 1 has over 800 photos, many of which are in color which are worked in to over 400 pages. A rarity index is included. Tom has self-published the book; copies are available directly from him. $80 for softbound; $110 for hardbound. I endeavor to have a complete review of the book in the near future. In the interim, Tom provides much more info here. Antique bottle collectors will know that this spring became sufficiently popular to spawn a business of bottling its waters. 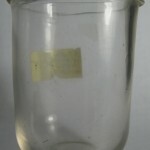 A quart cylinder with the embossing BYRON ACID / SPRING WATER is fairly rare. It was probably blown at the Lockport Glassworks. The bottles bear an iron pontil mark. According to Donald Tucker’s great book on mineral waters, examples are known in Lockport green, amber, deep emerald green, olive, aqua-blue-green and yellow green. 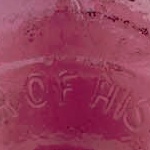 The bottle is listed in Tucker’s reference as N-5. Thanks to a recent Historic Glasshouse visitor for this Byron Springs photo! 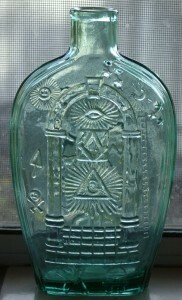 A rare deep blue green Byron Acid Springs bottle, mid 19th century. Weeks and Potter was a large company operating in Boston at 360 Washington Street in the late 19th and early 20th century. Bottle collectors will know them first for such popular items such as SANFORD’S JAMAICA GINGER, Sanford’s Radical Cure, CUTICURA and others. The company later became the Potter Drug and Chemical Company. Andrew Weeks and Warren Potter sold both retail and wholesale drugs in their business careers and represented many brands as an “agent” (today we would call them a distributor) These brands include Fetridge’s Balm of 1000 Flowers, The Ayer Company (think Ayer’s Sarsaparilla), Kidder & Osgood, and Schenck’s Pulmonic Balsam. I own a hardcover catalog from the company from the late 19th c. which has about 150 pages detailing their inventory. Hope to get more info from that catalog online in the future. The New Appetizer and cur for Dyspepsia and Billiousness. Distilled from Sea Products, and highly recommended by the best physicians. Put up in attractive non-breakable packages, two dozen to a case. Sells at sight. Pays handsome profits to the retailer. A fine colored lithograph with every five case order. Retail price 25 cents. The trade should always be ready to purchase an article which sells and pays a large profit. Such an article is “Sanford’s Camphor Ice” Neatly and handsomely put up, it is an ornament to any counter. Our preparation has been much improved since we first introduced it, and we are ready to guarantee it equal, at least, to any make on the market. As we are large importers of wines, we are able to secure a good selection, and the wine used in our “Beef, Iron and Wine” is one of the best flavored wines we keep. You may find it economical to handle this instead of your own make. You should look into the matter, get your figures and samples and see what we can do. We will bottle it for you, with YOUR label, at $4.50 per dozen full pints, if you order 12 dozen at a time, or we will sell you in bulk in quantity as desired. 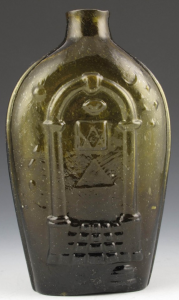 Bottle Makers and Their Marks is an important research project undertaken by Jullian Harrison Toulouse which he published in 1971. 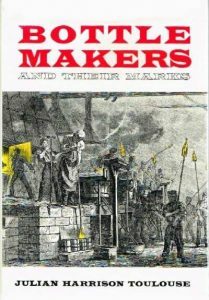 The book’s publisher, Thomas Nelson, Inc., responded to demand with a second printing a year later. It’s an encyclopedia of knowledge covering the marks found on vintage and antique bottles of the 19th and 20th centuries, both in the US and other countries. Collectors will find this to be an invaluable resource to research bottles which display embossing from manufacturing firms such as Whitall-Tatum, Owens-Illinois, Clevenger, and many a fruit jar manufacturer. 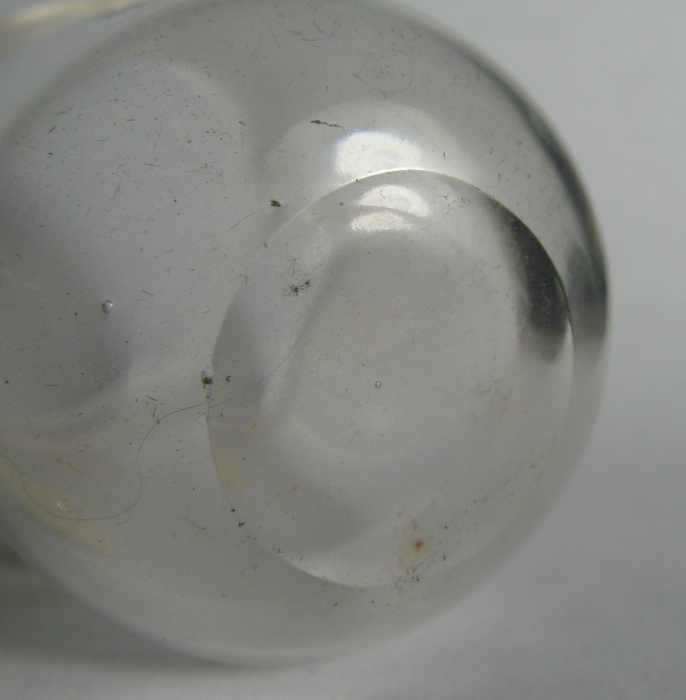 There is plentiful information on dating bottles according to company logos and mold numbers. Unfortunately, this book is, like so many amazing reference books on antique bottles, out of print. Chances are you will need to part with at least 50 dollars to get your own copy. I cannot imagine living without a copy; mine is open for reference all the time. There is also a soft cover reprint available. 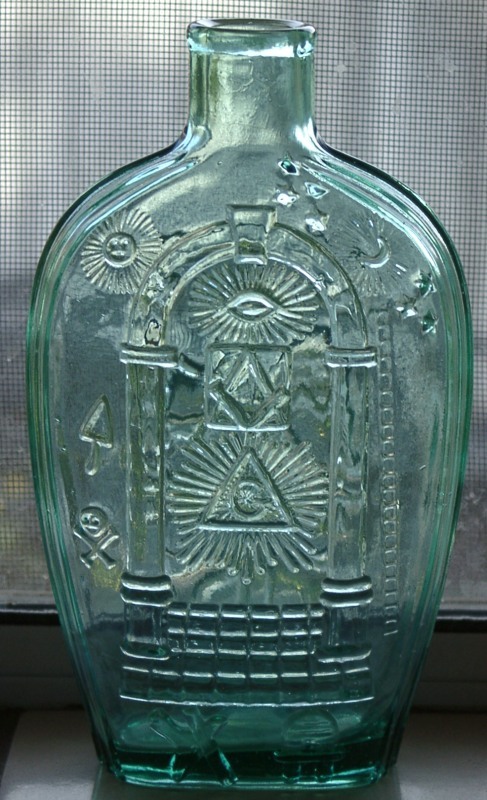 There are 43 documented molds of 19th century American historical flasks which portray a Masonic design on at least one face of the bottle. These flasks comprise Group 4 of American Bottles and Flasks and their Ancestry. In this group, several molds are quite rare and some examples are easily worth 30 to 50 thousand dollars. It is more likely that the collector or antique dealer would come across more common examples like the GIV-1 made in Keene, New Hampshire. There are plenty of examples to be found in aqua, although in amethyst it would be considered extremely rare. 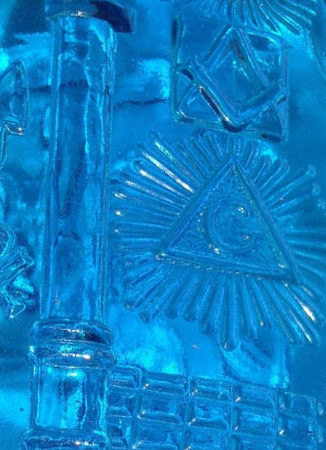 There are a considerable number of modern Masonic flasks in existence – I see them frequently on ebay and they are often described as authentic. With a little bit of study, it is fairly easy to tell the old from the new. 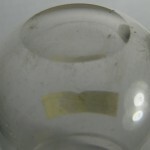 The most obvious indicators are on the base of the bottle: new examples have a well-defined rim around the outside edge of the base and there is no pontil mark. On some occasions you will see the embossing, “OLD STURBRIDGE VILLAGE” but it is my experience that most do not have this lettering. 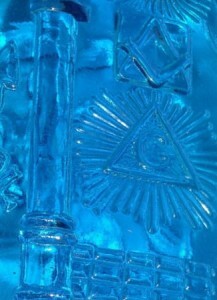 Colors of the reproduction include aqua, brilliant green and sapphire blue. 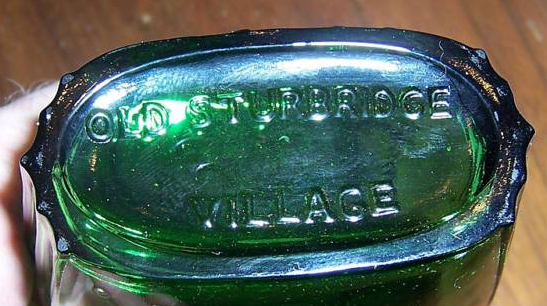 Old Sturbridge Village embossing on base. 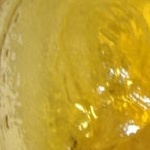 Note the well defined rim around the edge.